Hello and welcome to the 190th instalment of the SWD. The Syrian Democratic Forces have destroyed an ISIS front end loader in the eastern front and killed several ISIS foreign fighters, commanders and snipers in the western front. Five YPG have been killed in Raqqa clashes according to pro-PKK sources. 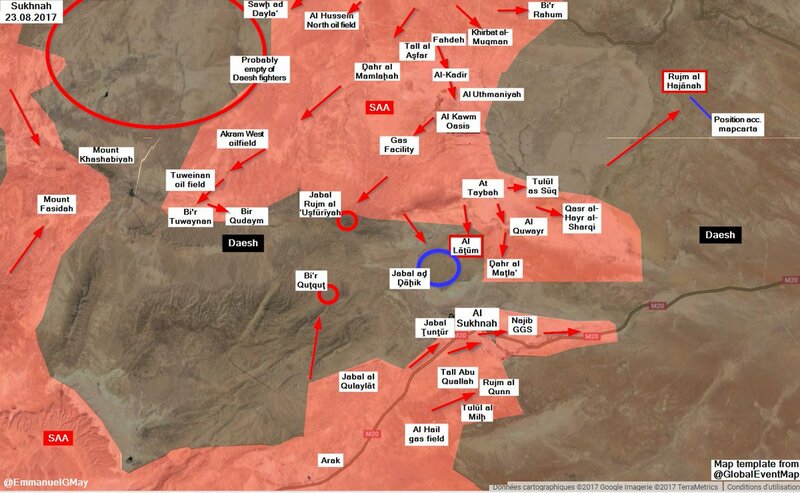 SAA forces recaptured Muqlah Saghira, Muqlah Kabirah, Salim al Hammad and Subayat from ISIS militants. This means that ISIS forces captured the territory a week ago despite SAA sources denying it. The SAA forces and allies have captured the town of Salba in east Salamiyah after shelling it with artillery and air strikes. 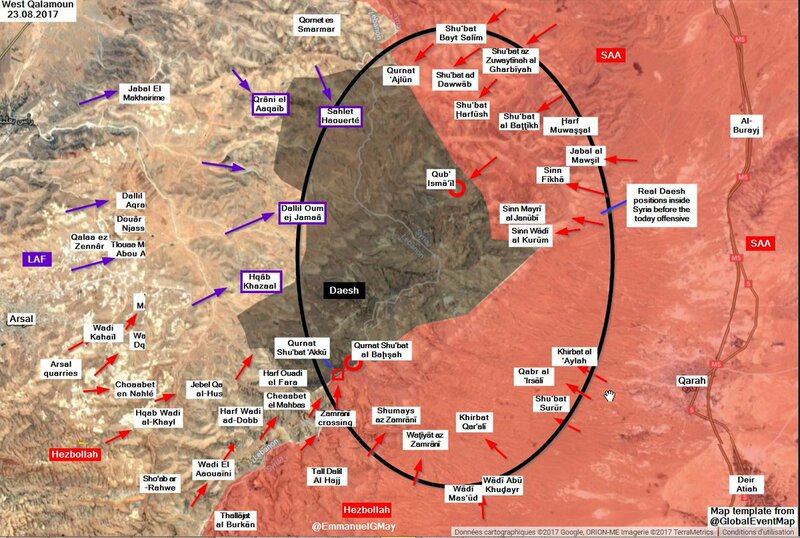 Apparently, late reports suggest that HTS has launched an attack against SAA forces stationed in the Salamiyah-Ithriya highway and captured an SAA checkpoint in Sheikh Hielal, and are heading toward JAni Bariyah and Wadi al Lozaib. Meanwhile, ISIS forces launched an attack on Ithriya road, too. IS forces have captured and destroyed a checkpoint using bulldozers. If true, HTS would be lifting the siege on ISIS forces inside the Uqayribat pocket and would show a degree of coordination between HTS and ISIS forces. The Syrian Arab Army has captured several sites, which reduced the eastern ISIS pocket significantly. The areas captured are ‘Asfouriyah, Usfuriyah, Bi’r QutQut, Hareef, Qasr al-Hayr al-Sharqi, and Raqd Wahsh. SAA also captured Jabal ad Dahik, north of Sukhnah town, and engineering units dismantled IEDs and mines left behind by ISIS forces. The Islamic State claims to have killed 20 SAA soldiers and Hezbollah fighters after a successful assault on Al-Wa’er positions close to the Iraq-Syria border. More than 170 persons from Talbisah and Rastan have surrendered and gave its weapons to Syrian Security Forces after settling up their situation. The SAA and Hezbollah units continue with the operations to retake the ISIS-held Syria-Lebanon border. Government forces, backed by Hezbollah militants, have retaken Wurnat Shu’bat al Bahsah and Qub’ Isma’il. One video uploaded by Hezbollah sources show that its forces are crossing and controlling the Mira crossing. Additionally, ISIS media claims to have killed at least 20 Hezbollah fighters today. Meanwhile, 8 ISIS militants surrendered to SAA forces in west Qalamoun. Shelling by government forces continued in Jobar district. Opposition sources announce they have damaged a Syrian government warplane in the Syrian Desert of Damascus governorate. PMU has captured At Tiniya, Tal Alsemen and Tashtiah villages. Also, Iraqi forces have captured the southern and northern Kefah neighbourhood on the southwestern axis of Tal Afar. The 9th Armor Division and PMU forces stormed the Tanik neighbourhood in East Tal Afar and took control of the health building. On the 22nd of August 2017, CJTF-OIR has conducted 16 strikes in Syria. CJTF-OIR‘s main focus in Syria is Raqqa region where they did 14 strikes supporting SDF‘s operations against IS destroying 26 fighting positions, an ISIS headquarters, a command and control node, and ISIS engineering equipment. Other areas where two strikes occurred are Abu Kamal and Deir ez-Zor destroying seven ISIS oil stills, two oil tanks and a separator. The full report on CJTF-OIR strikes conducted in both Syria & Iraq can be found here. This temporary arrangement between the armed opposition is probably a desperate makeover likely the SDF will soon join if allowed.